In general I use the following method for setting up my feh and stalonetray. This method might be overkill, but it has worked for me in Lubuntu, Pclos, WattOS, Slitaz and of course Ubuntu Openbox. My networking and volume control icons appear in the top left hand corner of the desktop. Once I have set this up I can then remove tint2 or fbpanel so I have a clear desktop and then use only a right click menu to access programs. My home folder is k1, ensure you replace k1 with your own username. A file named .fehbg in k1, which is hidden due to the dot prefix, this file has one line. A folder named .wallpapers in k1, the folder is hidden due to the dot prefix, this folder contains a textured background (95x80 1.6kB .jpg file) called ptv2.jpg. A folder named autostart in the folder .config in k1 which is a hidden folder due to the dot prefix. Folder autostart may or may not already exist, so add it if it doesn't already exist and then decide on its contents. A file named .stalonetrayrc in k1, which is hidden due to the dot prefix, this file has many lines. # Directives introduced in 0.8 are marked with "NEW in 0.8"
# (default). NEW in 0.8. # non-conforming WMs and/or stalonetray bugs. # icon_size NEW in 0.8. Restart and it should work. all quotes should be in quote tags and all code, command lines, content of configuration files should be included in code tags. Could you do that to ease the reading, please ? It is such a long time since I posted anything technical and I was in a hurry. I simply forgot about the code boxes with scroll bars. I will do the code tags right now as I am online with my Lubuntu desktop computer. Then I will go to my Ubuntu Openbox - Netbook computer and do a screenshot. Here are 3 (mtPaint) screenshots from my Netbook. The menu is a 3 stage multiple menu.xml. There are 3 menus : menu1.xml, menu2.xml, menu3.xml and they are selected in sequence by clicking the icon at the top of the menu. 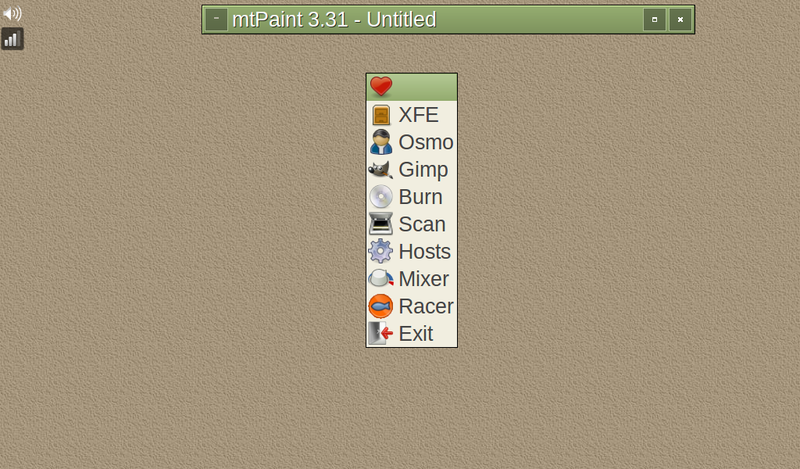 The .xml code for my Ubuntu Openbox (Netbook) menus will appear here soon (in code tags). 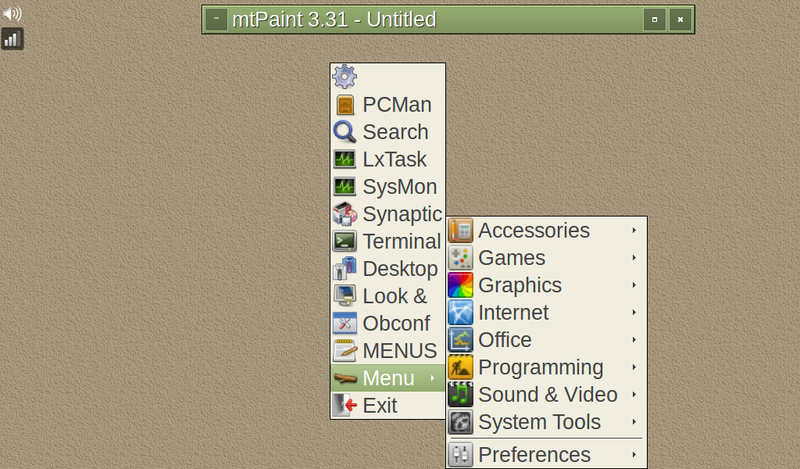 See this link for a general idea of how it works EDIT THE OPENBOX RIGHT CLICK MENU IN LXDE and ADD ICONS although I am not using LXDE for this Ubuntu Openbox version, most of the same methods apply - excluding the methods pertaining specifically to LXDE. I haven't got time to describe it all again. When I find the time I will add more here. Checked out your link. Wow, now that's what I call comprehensive! Looks neat. Thanks for the Village (debian) discs 1 and 2. I have also looked at the Scorpion web page. What is the practical side in using 3 different menu.xml files ? You actually have to try it out to appreciate it. I think this is a 'personal preference thing'. It becomes quick and automatic in use, once you have memorised where everything is. It eliminates submenus which I find extremely frustrating as they slow me down. I don't like hunting for items, I like to 'automatically' find them. As I said 'personal preference' and not for everyone. 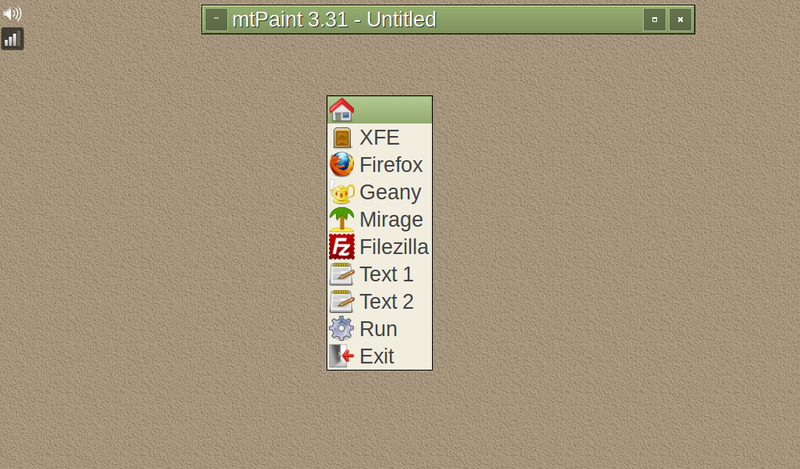 The MENUS editor selection on menu3 (opens in Geany) and makes it easy to customise the menus. As mentioned in one of my LXDE forum posts. Another practical advantage of a 'right click menu' (openbox default or multiple customised) would be in the case of multiple monitor screens with a very large total area. Mouse movement ('sweeping of the mouse two or three times') across the from one monitor to another monitor to click the menu is eliminated. The 'right click menu' is always available at the exact spot your mouse cursor is located, provided you are not over a window. The multiple menu system increases overall speed by 'scrolling' through the 3 menus with multiple left or right clicks (initially a right click). This is possible because the menu always remains visible when the right or left click is released, until a click occurs away from the menu. The xdotool code in the menus is key to attaining smooth and stationary switching of the menu . Remember to install xdotool so the xdotool code works. Pixel values in the code might need to be tweaked to match your menu font size. It might be best for me to start a new topic for the menu system and copy the relevant information over to it? I don't know about xdotool, but I'm eager to know more about it. You can start a new topic, or not : as you feel best and more relevant. It's up to you. Just if you start one, maybe would you provide at the end of the present thread, a link to it, just in case it could be useful. Sounds like a good idea. Hey, a new user who is technically proficient and produces well-written documentation! I like it! But moving right along! Multiple menus - food for thought for DebWeb? isn't DebWeb a spin using Lxde ? If so how could it fit in ?